Ten terrified turtles went traipsing through the turnips in Tennessee. 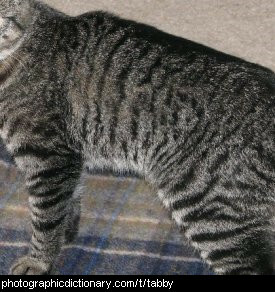 Tabby is a pattern made up of stripes, spots and swirls that is usually seen on cats. It helps them to camouflage so they can sneak up on their prey. 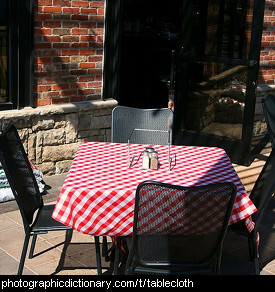 A table is a large, flat piece of furniture with long legs. You usually sit around a table on chairs and eat dinner. Small tables are often put near sofas so people can put their coffee cups on them. Most tables are made out of wood, with either wood or metal legs. Tables can be round or square. 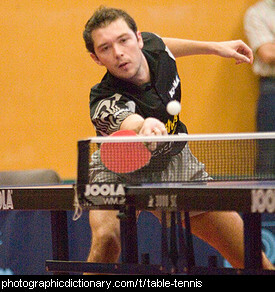 Table tennis, also called ping pong, is a game where two or four people holding paddles bounce a light, hollow ball across a table with a net in the middle of it. The idea is to only bounce the ball once on each side of the net, and if you miss the ball and can't hit it back, your opponent gets a point. 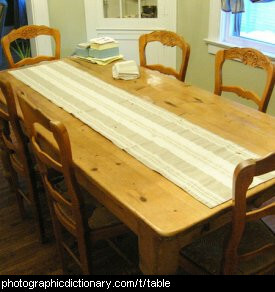 A tablecloth is a piece of fabric or plastic that you put over your table. Tablecloths can be either for protection or just for decoration. 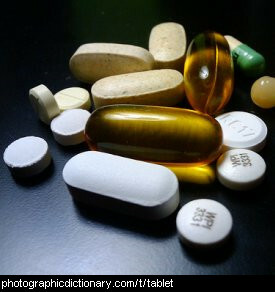 Tablets, also called pills or capsules depending on their shape, are small objects that you swallow. Tablets usually have something like medicine in them that makes you better. People most often take pills to stop a headache, or to stop them being sick. 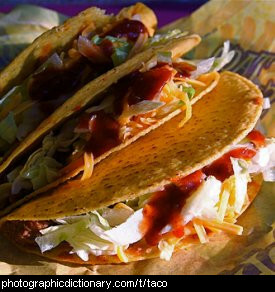 Tacos are a Mexican dish made from a wheat or corn tortilla wrapped around a filling. The fillings are usually spiced ground beef, lettuce, tomato, onion and cheese. Some kinds of taco have a hard shell rather than a soft one. 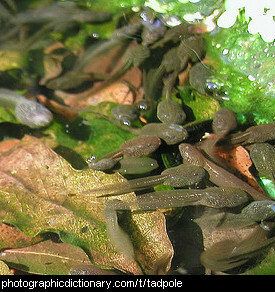 Tadpoles are the larval stage of frogs, and spend their lives in water. They hatch from eggs, and gradually change into frogs. Tadpoles cannot breathe outside of water, they have gills like fish. 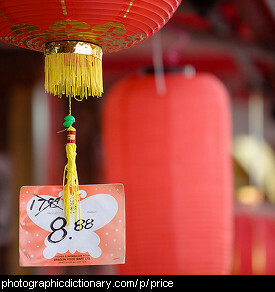 A tag is a small piece of paper or cloth attached to something else. Tags usually have information about the thing they are attached to. The tag in the picture is a price tag. 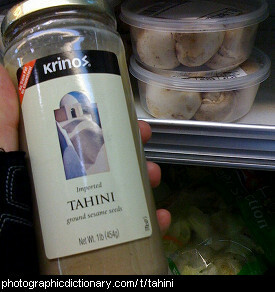 Tahini is a paste made from ground up sesame seeds. It is a major ingredient in hummus. Most animals have tails - people and apes don't. 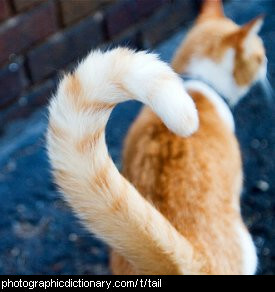 A tail is just an extension of the animal's backbone. Animals use their tails to communicate - dogs wag their tails when they are happy, cats wave their tails when they are angry and put their tails straight up to say "hello". Animals like cows and horses use their tails to swat flies away. The kangaroo has a big, heavy tail that it uses to balance itself when it hops.